The Ateneo Blue Eagles barely got the chance to take flight during the opening game of UAAP Season 78 in MOA Arena last Sunday. The Blue Eagles were manhandled by the FEU Tamaraws by a whopping 24 points. The final score was 88-64 as the Blue Eagles started their season with a loss against the early season favorites. Ateneo trailed FEU for most of the game. They trailed by 12 points after the 1st quarter, by 18 at the half and then by 15 after 30 minutes of action. The Blue Eagles were unable to crack the double digit lead all throughout the game. FEU controlled the game with their ball movement and timely outside shots to keep Ateneo at bay. The Blue Eagles found themselves scrambling on defense too often and their shots were not falling on the offensive end. A lot of the credit should go to FEU for playing a superior ballgame. The FEU foursome of Mac Belo, Mike Tolomia, Raymar Jose and Roger Pogoy combined for 68 points which is 4 points more than the team total for the Eagles. They took turns in preventing the Ateneans from making the game somewhat close and competitive. The cohesiveness and chemistry of the Tamaraws clearly showed as they attacked whatever defense the Eagles threw at them. FEU took care of this game early, much to the chagrin of the Ateneo crowd. 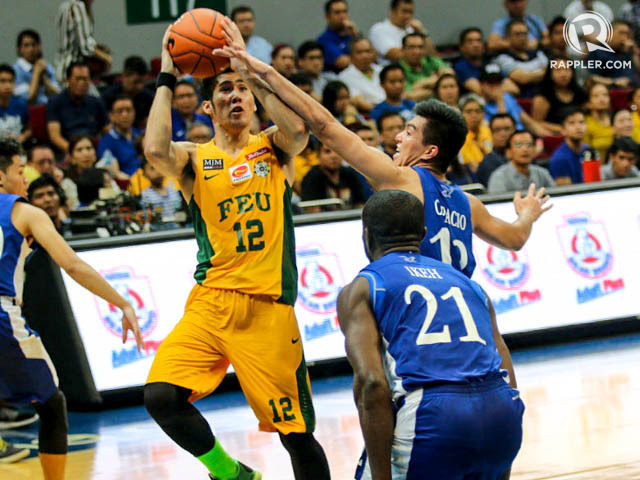 The Tamaraws did not look rattled at all whenever Ateneo made consecutive baskets. Despite the lopsided score, Ateneo got an exemplary game from Kiefer Ravena who led all scorers with 25 points. Ravena did his best to keep them within striking distance but his solitary effort was not good enough against a team that had so many weapons. Another bright spot was Gwyne Capacio who chipped in 14 points in support of Ravena. Sadly, the Eagles needed more from the rest of the squad but the much needed help did not arrive. Ateneo rookie point guard, Jerie Pingoy played miserably in his debut. He did not make a basket, committed two fouls and looked nervous during the entire game. Pingoy was not the only one who struggled in his first game with the Blue Eagles. Other newcomers like the Nieto brothers, Hubert Cani, Adrian Wong and Ikeh Chibueze combined for just 8 points. It didn’t help at all that sniper Von Pessumal was shooting blanks for most of the game. The Blue Eagles are a young team filled with rookies, so mistakes and a lack of experience were expected. Hopefully, the Blue Eagles can learn and grow from this humbling defeat because there are 13 more games to follow. They need to trust each other and they have to trust their system. 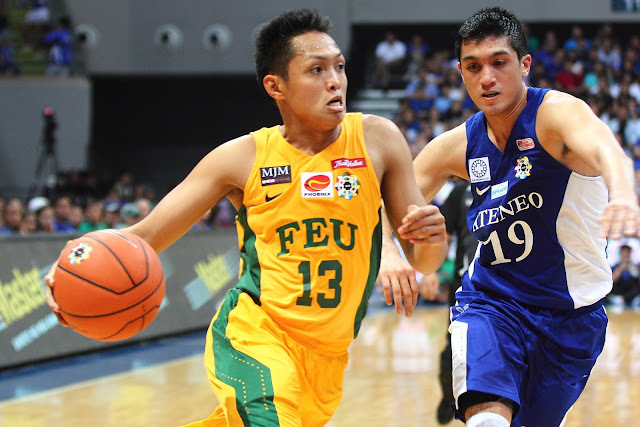 FEU 88 – Pogoy 19, Tolomia 17, Belo 16, Jose 16, Escoto Ru. 6, Inigo 5, Arong 5, Dennison 4, Orizu 0, Escoto Ri. 0, Trinidad 0, Holmqvist 0, Tamsi 0. 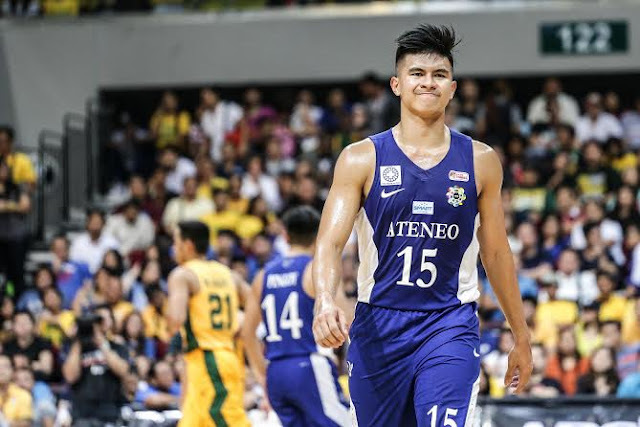 ADMU 64 – Ravena 25, Capacio 14, Pessumal 9, Gotladera 6, Wong 4, Ikeh 2, A. Tolentino 2, Cani 2, Pingoy 0, Ma. Nieto 0, V. Tolentino 0, Mi. Nieto 0, Babilonia 0. Quarter-scores: 23-11, 44-26, 64-49, 88-64.